You'll receive this quest when you add Kana to your party. Kana will tell you that he thinks the Tanvii ora Toha (aka the Book of Virtues) is hidden somewhere beneath Caed Nua, and he'll ask you to help him search for it. When you eventually reach the exit leading to the Endless Paths of Od Nua, Level 2, Kana will stop you and give you some more details. He'll tell you that he believes the book was written by an Engwithan mage named Gabrannos, and that he hopes it will prove to the Rauatai that they should start favoring peace and the trade of knowledge. 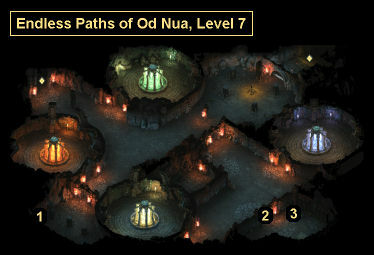 You'll find Gabrannos' study on Level 7 of the Endless Paths (#2). You'll have to pick up an Old Copper Key (#1) to unlock the door to it. A Skeletal Wizard -- perhaps Gabrannos himself -- will attack you when you enter the chamber, but all you'll find inside is a broken tablet (#3) that won't answer any of Kana's questions. Kana will be disappointed by this turn of events, and all you'll be able to do is try to ease his pain -- or not. None of your dialogue options with Kana will change anything in the game, except for possibly Kana's ending.